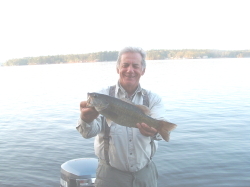 This entry was posted in Conservation, Fish Recipes on April 29, 2018 by ronniegarrison. Use your “freezer fish,” and avoid fishmonger sticker shock! Depending on where you live, it seemed like a long and cold winter, where cleaning out the freezer of last season’s salmon and trout fillets just wasn’t in the cards. Now that most of the “arctic blasts” are over, it’s time to start reliving some of last year’s great angling memories and making room for some of the fresh fish from springtime adventures that are just around the corner! It’s time to clean out the freezer and turn those fillets into great eating and economical smoked trout and salmon. Instead of $26-$60 a pound for questionable quality, the Little Chief smoker let’s you make “great eats” for pennies on the dollar. The big bonuses for doing some “refrig-rummaging” is that not only are you going to win a few points from your significant-other and cleaning out the freezer, but you’re going to turn out some mouth-watering smoked fish and likely discover new neighbors and friends that you never knew you had before. Many of us live in areas where smoked salmon and trout are not something you can find at the local grocery store, or even a fresh fish mart. For many, it’s a treat and delicacy that can be only found by ordering on the Internet, and often times with less than delicious results. 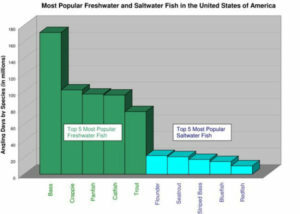 Do a quick computer net search and it is not uncommon to see smoked salmon selling for $26-$40 a pound, and rainbow trout at $60 a pound. Add in shipping and questionable eating quality, and I have very few friends that I want to spend that kind of $$$$ on! Instead, of suffering from credit-card-sticker-shock, it is drop dead easy to make it yourself for literally a few pennies on the dollar. Begin by defrosting your trout or salmon fillets. Ten pounds of fillets are going to smoke, dry and end up producing about 3-4 pounds of smoked fish when finished. If you want to take the fillets and turn them into jerky instead of moist fish bites, all you do is follow this same recipe and just increase the drying time until the fillets have about 90 percent of the moisture reduced. Ten pounds of fish fillets will turn into around 1 pound of jerky. In order to keep everything as simple as possible and easy to prepare, our top choice for the brining process is the Smokehouse Trout & Salmon Brine Mix (www.smokehouseproducts.com). It’s a prepackaged, premixed combination of salt, sugar and flavorful spices that mix up with 2-quarts of water and can be used for up to about 15-pounds of fillets. If your fillets are more than ¾ of an inch in thickness, use a sharp knife and do some simple cross-cuts laterally on the flesh-side of the fish. This increases the surface area of the fillet and allows it to better absorb the brine and spices. The Smokehouse Trout & Salmon Brine Mix is prepackaged, premixed with salt, sugar and spices, and ready to use with 2-quarts of water. One box will do up to 15 pounds of fish and marinates your fillets in the refrigerator overnight or up to 24 hours. 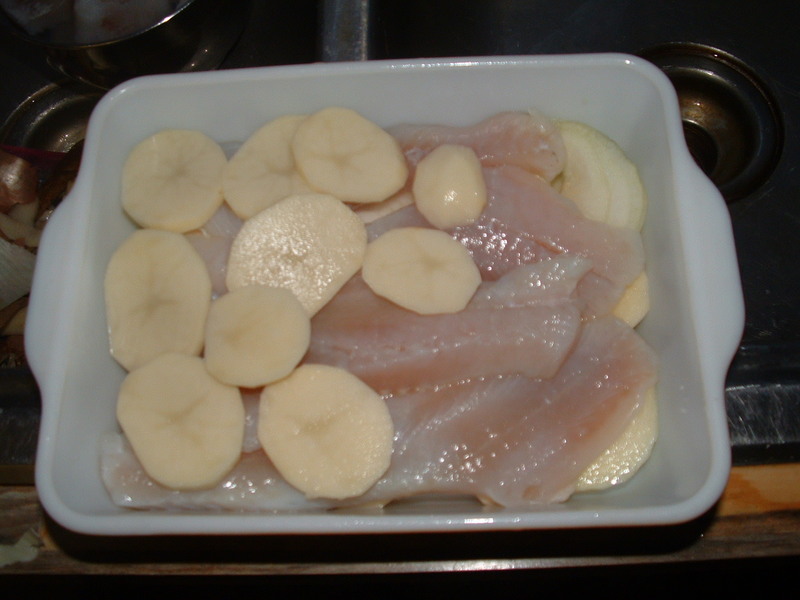 Once mixed, fish and brine are put in a glass bowl or small plastic bucket and allowed to marinate for 8-12 hours. Even 24+ hours of brining won’t hurt a thing, and we often throw the bucket in the refrigerator and let it soak overnight. The real chemistry behind brining is actually pretty simple. All fish, poultry and meats already contain salt water. 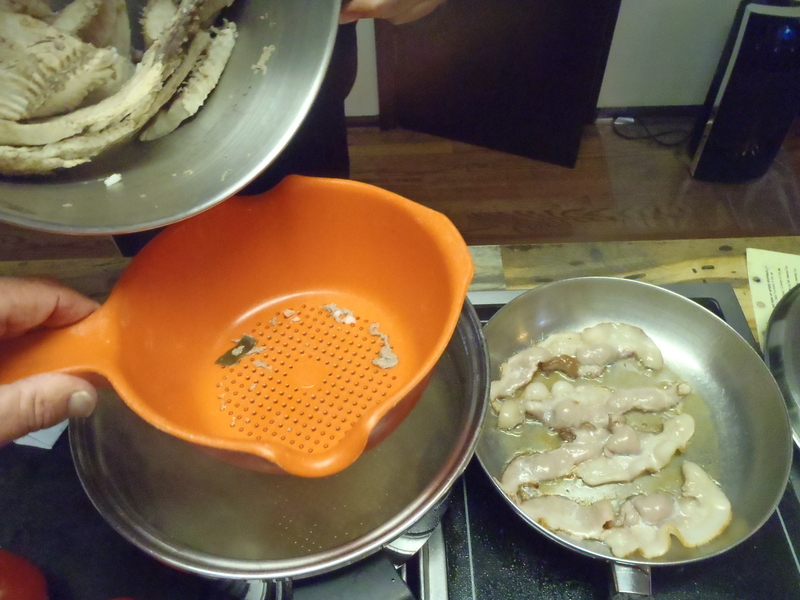 By immersing and soaking them in a liquid with a higher concentration of salt, the brine is absorbed into the meat. Whatever spices and flavors that are in that brine are absorbed as well. After marinating, gently rinse the fillets and lay them out on your smoker rack to air dry for approximately 1-hour. As always, spraying the racks, even the supposedly “non-stick” types, with a non-stick spray or wiping the surfaces with vegetable oil will keep the fillets from sticking while smoking and drying. Smokers are as much a personal choice and preference as trying to suggest what make/model of car is your favorite. For home-use, ease and affordability, there is little question as to why the Smokehouse Big Chief or Little Chief electric smokers (www.smokehouseproducts.com) reign supreme. They’ve been around since 1968, are easy to operate, provide constant temperatures and turn out “great eats.” Virtually everyone we know began their smoking-careers with one of these! Regardless of your smoker choice, the idea behind all smoked fish is to dry/dehydrate and add flavor, without turning it into a high-temp oven. Low, slow and with temperatures of 165 degrees F to no more than 200 degrees F is the key to success. With the fillets on the racks, you’re ready to add your personal touch and “flavor profiles.” Once brined, some folks like to just use the flavor from the wood smoke. Others want to go with Cajun, Lemon/Pepper, Chili, Mexican, Teriyaki, Dill, Rice Vinegar, and Hoisin or seasoned-salt options. Here is where you are limited only by your imagination! Into the smoker, and our favorite wood flavor is Alder, because it is a light wood and delicate. For a sweeter touch, try apple chunks or chips. If you want to go bolder, try cherry, mesquite or even hickory. As with all smoking of fish or game, too much and it becomes overpowering and equates to eating a charcoal-briquette offering. Alder wood chips or chunks are the favorite for making your own smoked trout and salmon. Three or four three pans of chunks/chips will add a light smoke flavor without overpowering the delicious taste of the fish. Our best results are from using 3-4 pans of wood chips (one immediately after the other) in total. Each pan of chips will burn/smolder/smoke for approximately 45 minutes, so you are actually smoking the fillets for about 3 hours, and they should start to turn a light golden brown as the smoking process continues. After the smoke, simply use the heat from your smoker to finish the fish, which can vary greatly, depending upon outside temperature, wind conditions and even air humidity. Based on those outside weather conditions, your smoked fillets will be ready in anywhere from 3 ½-8 hours. At this point, the fillets can be brushed with additional Teriyaki, honey, Hoisin, soy sauce, etc. Just keep checking them periodically and dry them till they are done to your taste and texture. Once smoked and prepared to taste, remove the fillets from the racks to prevent sticking and let them final cool/ air dry for an hour. This however is the most difficult part of the entire process, for you’ll be guaranteed that the temptation to taste, sample or simply eat will be virtually overwhelming. If there are any left to save for later, zip-lock bags and into the refrigerator will let them last up to a week or more. Put into vacuum sealed bags and placed into the freezer, they will last for many months and simply need to be defrosted when ready to eat. Our rule of thumb is… if you think you made enough, you probably will soon discover that you should have doubled the recipe. Bon appétit! This entry was posted in Fish Recipes on March 21, 2016 by ronniegarrison. I don’t cook many stripers and hybrids. They have a line of dark red, oily meat along their sides and it has a very strong fishy flavor. I would much rather eat a spotted bass or crappie. And when I try to cut out that dark meat as many suggest I just make a mess of the filet. I do have one good recipe for those strong tasting fish. I took one of the filets and put it in a baking pan, covered it with slices of bacon and onion, covered it with tinfoil and baked it for 30 minutes at 350 degrees. Then I took the tin foil off and put it under the broiler for five minutes to brown it some. Its very simple. A filet from a three to five pound striper or hybrid is what I like. I spray a baking dish with no stick spray and lay the filet in it. I then completely cover the filet with strips of bacon. Top that with onion slices about a quarter inch thick, cover and bake. Delicious! Cooking it that way removes the strong flavor and it is good. I usually cook potatoes au gratin and broccoli to go with it and it makes an excellent meal. The weather is getting nice and everyone will be fishing a lot in the next few weeks. I hope you can be a good, consistent fisherman rather than a luck fisherman like me. And if fishing gives you lemons, not the fish you are after, make lemonade by cooking them in a new and different way. This entry was posted in Fish Recipes on February 27, 2016 by ronniegarrison. I Love To Cook – and Eat! I love to eat and love to cook, two things that go together well. This time of year we have a lot of fresh vegetables to eat or cook, making both even better. Squash are easy to grow and plentiful, and if you buy them the price is not bad right now. Many years ago I had a lot of fresh yellow squash from my garden and wanted a different way to cook them. I like them sliced and fried or steamed with onions, and even fry the male blooms, but I had so many I need another way to cook and eat them. This was before the internet where you can find millions of recipes fast, so I got out one of my favorite cookbooks, “Southern Country Cookbook” put out by Progressive Farmer magazine in 1972. I often refer to it and find recipes I like, even if I do change them some. One recipe, “Skillet Dinner with Squash” caught my eye. It called for browning ground meat in bacon grease then adding chopped bell peppers, sliced squash, chopped tomatoes, salt and pepper and simmering for 40 minutes. I decided to brown the meat with chopped onions and used canned tomatoes with jalapeno peppers. I was not sure how it would taste, but it was great! Of course I used ground venison, not beef, and increased the amount of bell peppers. I now cook it anytime I have some squash and it is great for lunch or even dinner. For dinner I eat it with a salad. A couple of weeks ago when my wife was out of town I went to the freezer and found a package of sliced deer liver. Linda doesn’t like it so I usually cook it when she is out of town. I love it and was real disappointed that this was the last package I had. 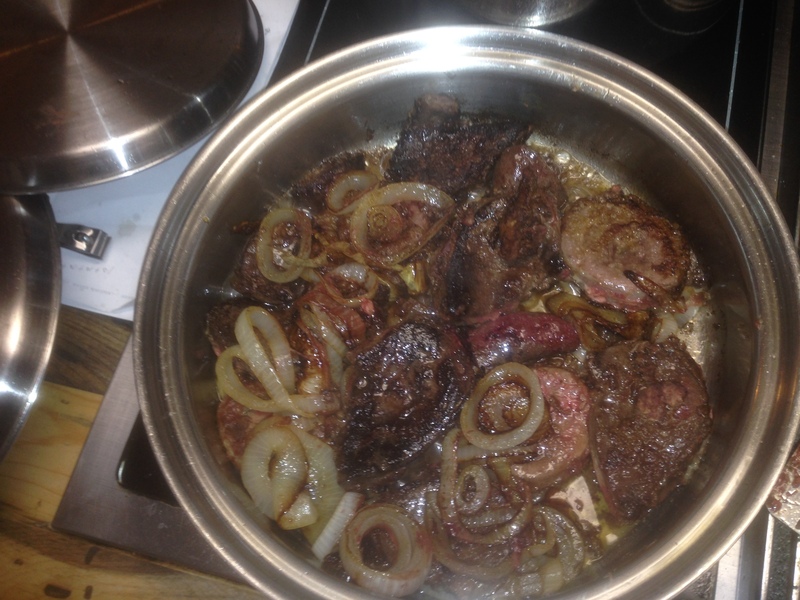 I floured and sautéed the liver in bacon grease along with a bunch of sliced onions. 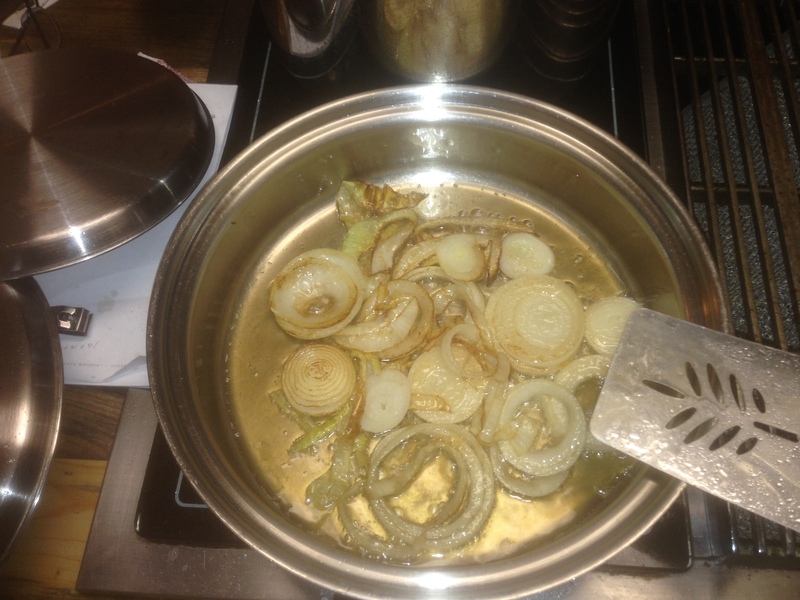 When the liver and onions browned I added water and covered it to simmer for about a half hour. 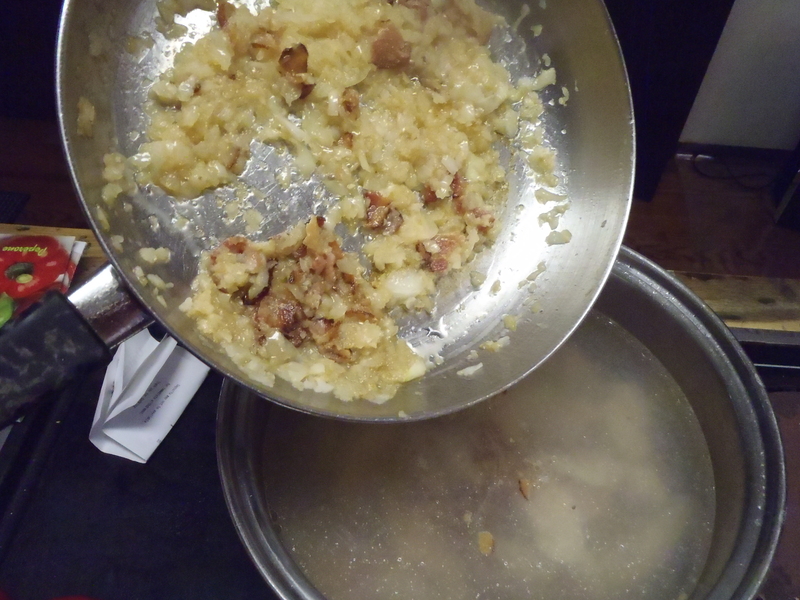 While it was simmering I sliced potatoes and more onions and browned them in more bacon grease. I always have to have a green vegetable with my meals so I got out some frozen Brussel sprouts and thawed them in the microwave, then dribbled butter over them on a cookie sheet and put them in the oven under the broiler to brown almost to the point of being blackened. 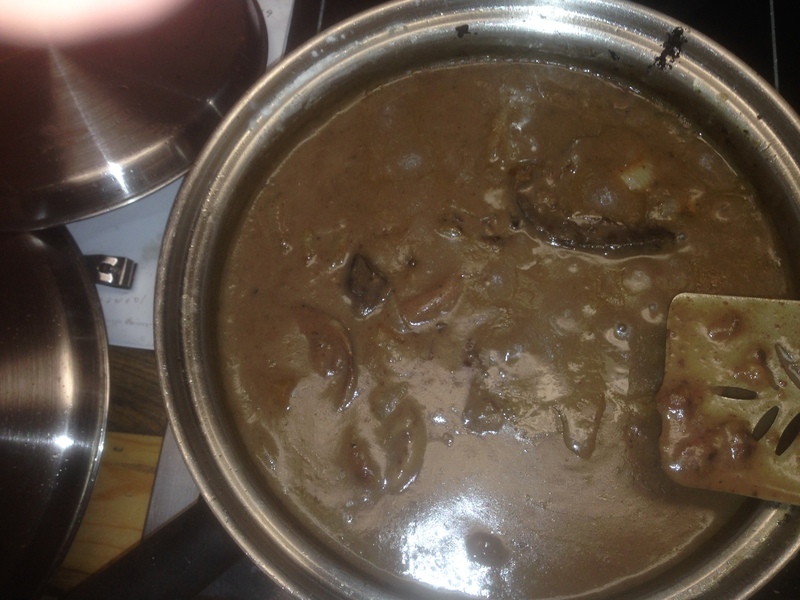 I make sure I have enough gravy in the liver pan to smother the liver and potatoes on my plate. It is a greasy meal but it taste great and I had enough for two meals. I had made a lot of gravy so I had about two cups left. So it would not go to waste I took a package of ground venison, about a pound, and made two big hamburger steaks. 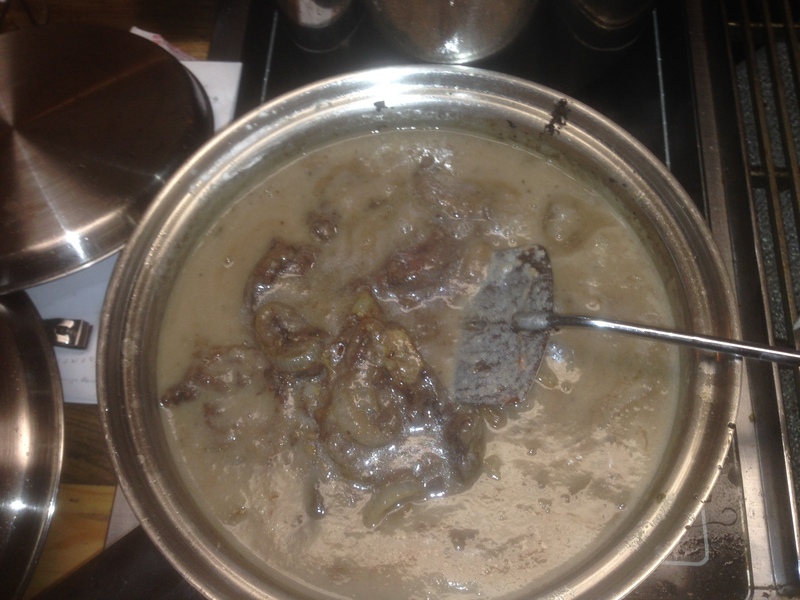 I first sautéed onions in more bacon grease and fried the hamburger steaks with them, then smothered all of it with the liver gravy and simmered for about 15 minutes. With French fries and cole slaw it was another great meal! After the Sportsman Club Bartlett’s Ferry tournament last month I kept some spots to clean. I fried some of the filets but kept about a half dozen filets from one pound bass to make a casserole. 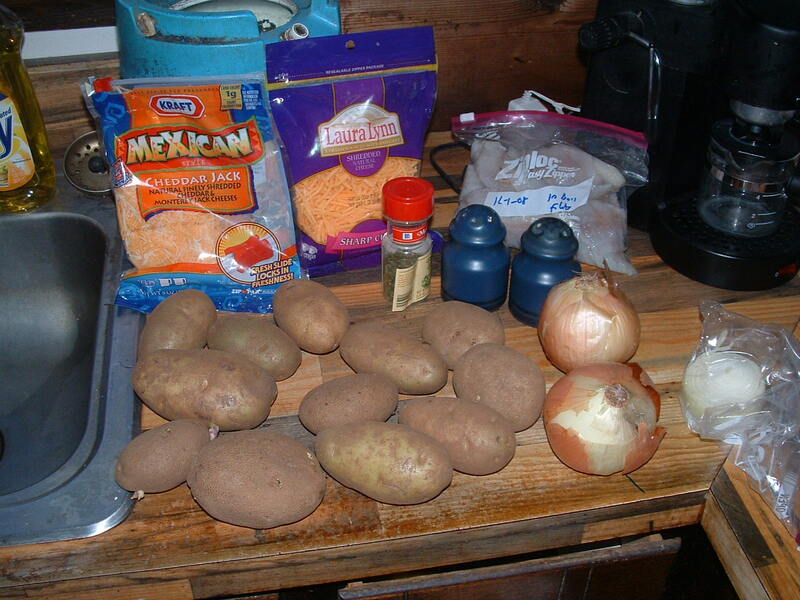 It was simple, I sliced potatoes fairly thin and layered potatoes, filets and grated cheese in a big baking dish. After adding a little milk I baked it until the potatoes were soft, the fish done and the cheese melted. All I needed with that casserole for a meal was a salad to go with it. Writing this made me hungry. Time to go cook something! 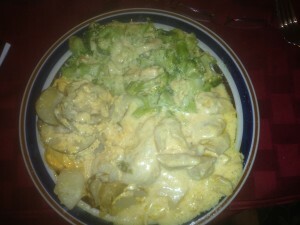 This entry was posted in Fish Recipes on July 4, 2015 by ronniegarrison. I love any kind of fish or seafood stew or chowder. Anytime I go to a restaurant I check and order it if it is on the menu. And I make several kinds at home from the fish I catch. 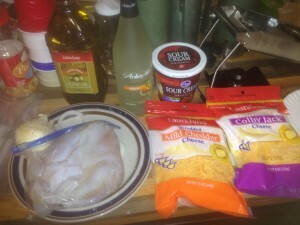 I filet all my fish first. Sometimes I save the bones and little bit of remaining meat on them, especially if I am making my version of a Manhattan style fish stew. The bones give it a stronger fish flavor and make a good stock for this kind of stew. For my Manhattan style stew, I filet about five bass and keep the filets and bones. This will make about six quarts of stew, and it freezes well. 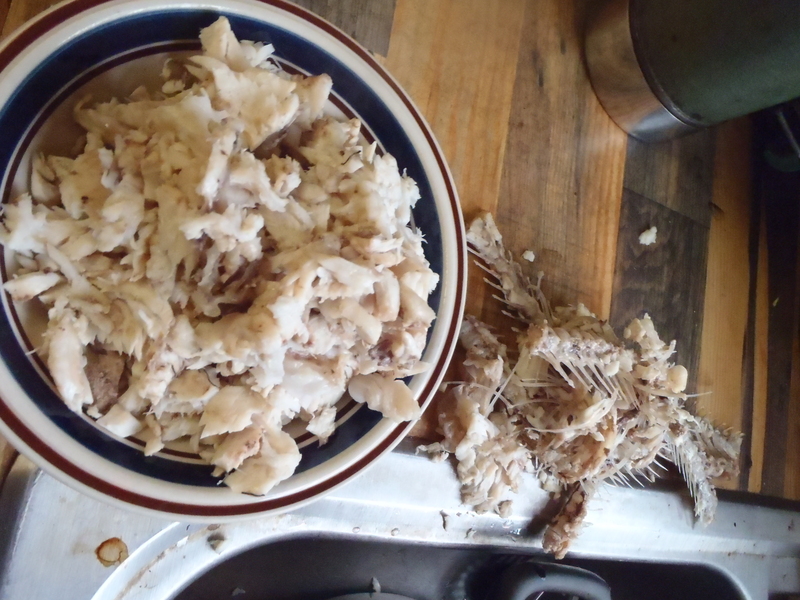 After washing carefully, I put all of the bones in an eight quart pot and cover with water, keeping the filets to the side in cold water in the refrigerator. As it starts to warm I add a few bay leaves, salt and pepper and some other spices like thyme if it sounds good. i bring this mixture to a boil and turn the heat back to barely keep it boiling until the meat is done and white and the bones have time to flavor the stock, about 30 to 45 minutes. But the time is not critical, a little longer just makes the flavor stronger. Boil the bones to make fish stock. 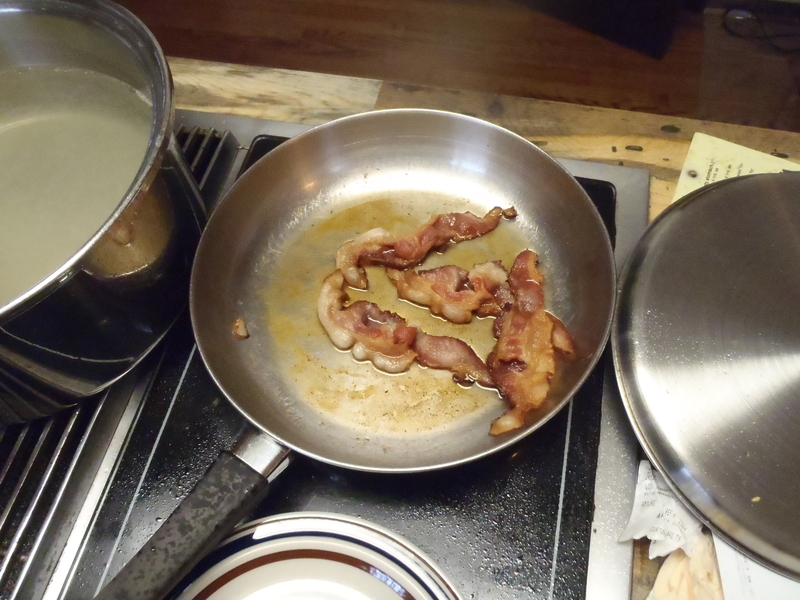 While the stock is boiling I fry about six strips of bacon in a frying pan until they are crisp. 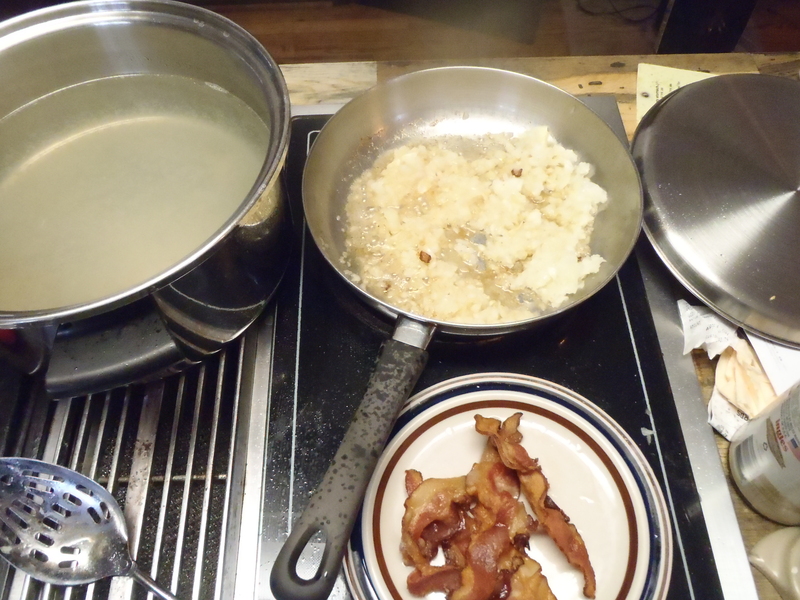 Remove the bacon and sautee onions in the bacon grease until slightly brown. 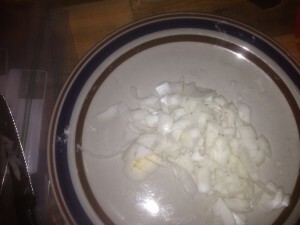 You can skip this and add the chopped onions raw, but I like to brown mine. Chop them as coarse as you like. Sometimes I use a blender and chop them very fine, other times I just coarse chop them. 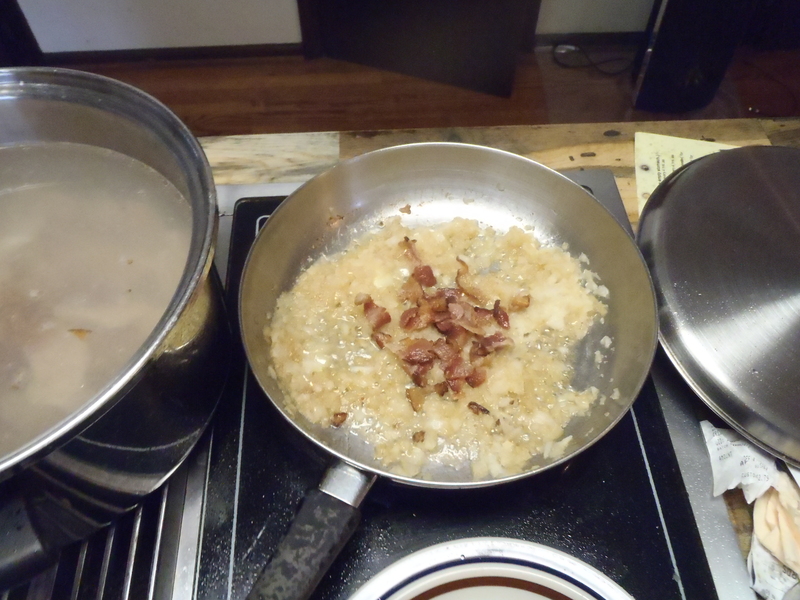 Crumble the bacon and add it to the onions for more flavor. Let it cook a few minutes then remove from heat. Drain the broth to remove all the bones. Take the meat off the bones and add that meat back to the broth. I carefully squeeze every bit of this meat to make sure there are no small bones in it. Add onions and bacon to broth as it simmers. 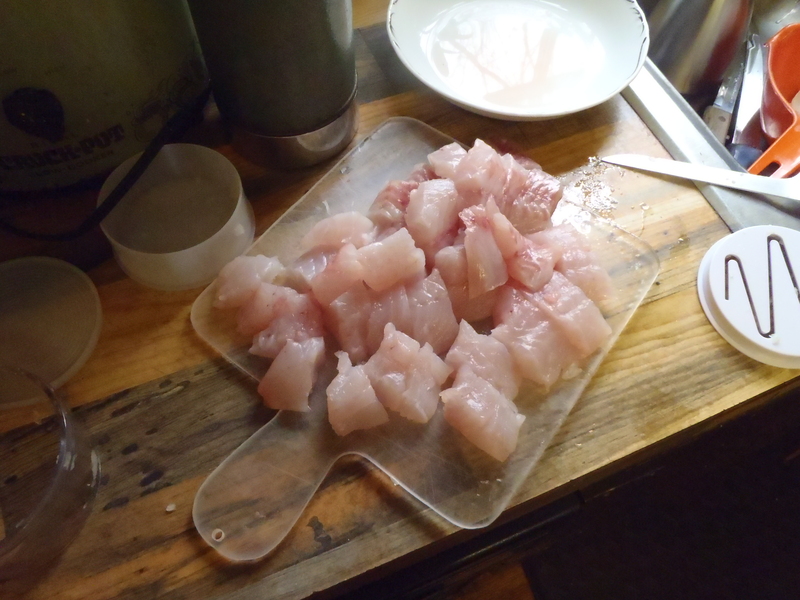 Cut the fish filets into chunks – I like mine about 1.5 inch squares. Add the fish to the simmering broth. Add a can or two of diced tomatoes to the stew. I like to use tomatoes with chilis in them for a little kick. 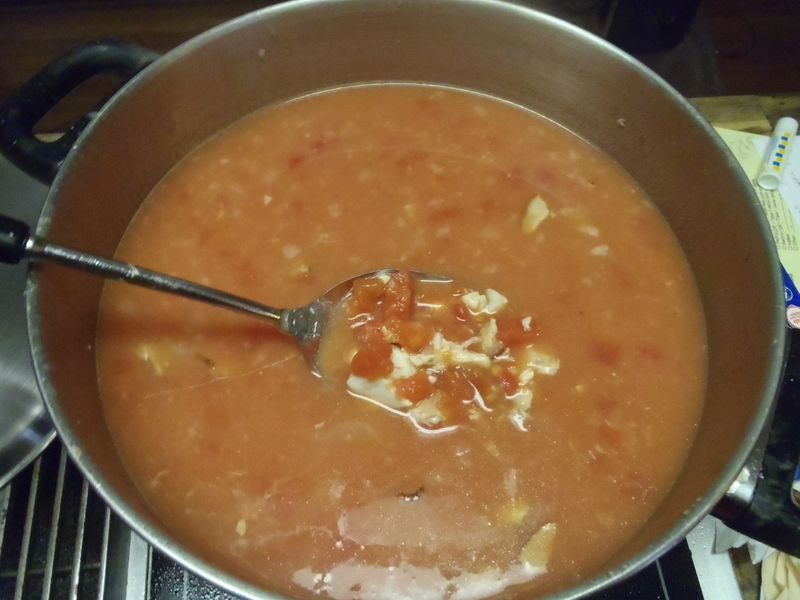 I like a very tomato flavored stew, so I add a can or two of tomato soup, paste or sauce. Add enough to suit your tastes. Simmer for an hour or so and it is ready to eat! For a heartier stew, add some rice to the stew and cook until the rice is done. Or for variety, cook the rice separately and spoon the stew over it. I like my stew straight and eat it with saltine crackers. 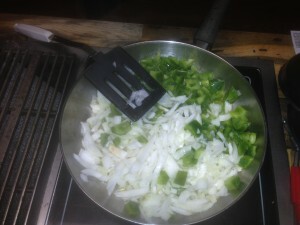 I do like to add some Tabasco or other hot sauce to spice it up – sometimes I like it HOT! 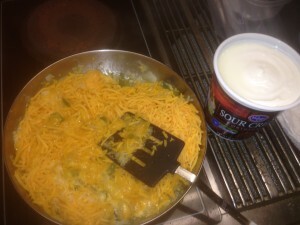 This entry was posted in Fish Recipes on May 5, 2015 by ronniegarrison.